Sorry, we can't divulge tile name of this famous-make in this advertisement due to ttle sensational LOW TRICE. Terrific barnain. Available in Cals. .380 or .22 Long Iliac Blue. Gift boxed, only $10.95 while they last. Dependable, compact. Makes excellent target & protective sidearm. Specs: Swinging-out cyl., 6-shot. 4" barrel, fixed sights, orlg. Colt hardwood grips, newly blued, good „condition inside out. Fires popular .38 Colt ammo. Only $32.50. 1221 S. Grand Ave., Dopt. C-7 lo* Ang*l«s 15, Calif. 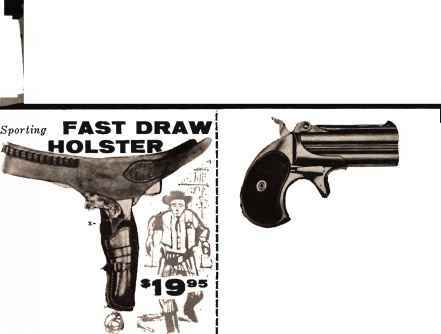 If you want to be an pert gun slinger and first to draw, then this is the holster for you. This authentic fast draw holster keeps you from coming out second best. Expert leather craftsmen cut top grade saddle leather to your individual requirements. insuring a good fit, feel, and freedom of action; Reinforced and heavily stitched for a lifetime of thrilling fast draw feats. 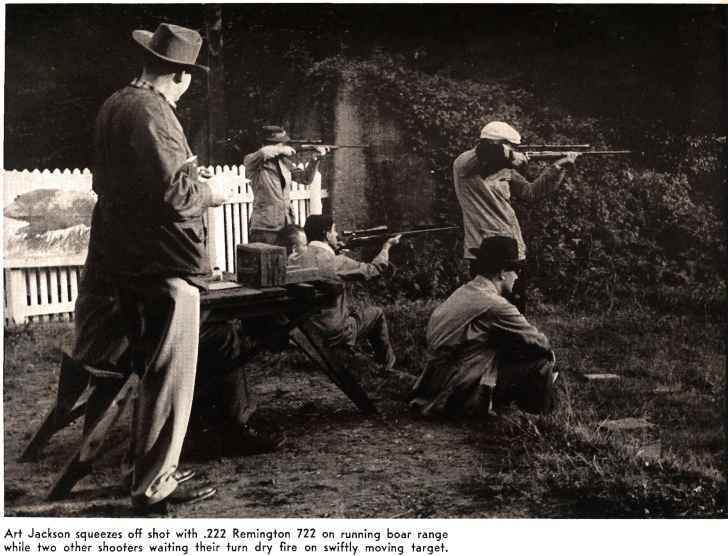 Give waist, hip measurement (choice of either .22, .38 or .45 calibers); make and barrel length. Available in black or saddle leather finish. Complete belt and holster (regularly $30.00) only $19.95. Lefty's add $2.00. Holster alone $7.50.